One month after both revolving and non-revolving consumer credit hit fresh all time highs, the Fed reported that in September total consumer credit rose to $3.950 trillion, rising $10.9 billion in the month, or a 3.3% SAAR, and missing expectations of a $15 billion increase. What was surprising is that or revolving debt, i.e., credit card usage, unexpectedly shrank by $312 million after jumping $4.6 billion in August. 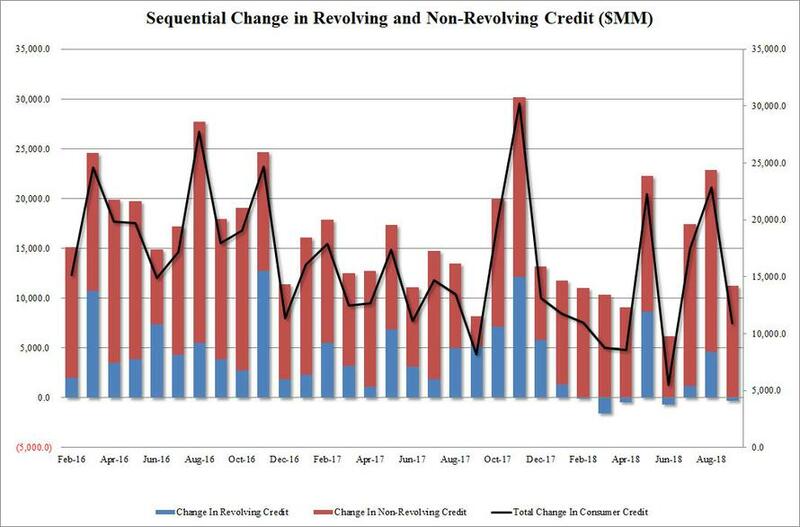 This was the 5th monthly decline in credit card usage in 8 months; it also means that in the 9 months of 2018, there has been a decline in revolving credit in more than half. Incidentally, until 2018, credit card debt had posted a streak of 4 consecutive years in which there had not been a single decline starting in 2014. With this month's reduction, total revolving debt was $1.041 trillion. At the same time, growth in non-revolving credit, i.e. 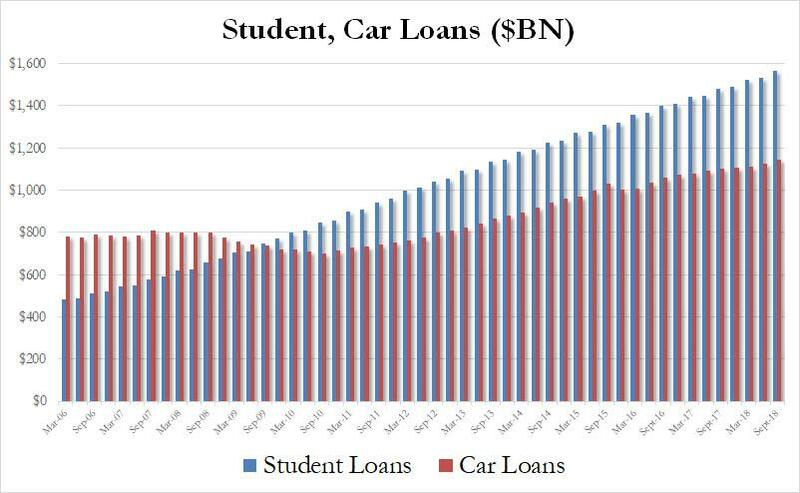 student and auto loans, also dipped, increasing by only $11.2 billion in September, a sharp drop from August's $18.3 billion increase. With the September increase, the total non-revolving debt outstanding increased to $2.91 trillion. Non-revolving lending to consumers by the Federal government, which is mainly student loans, rose to $1.228t. And while the drop in revolving credit will once again prompt questions about the resilience of the US consumer as the US economy entered the fall, one place where there were no surprises, was in the total amount of student and auto loans: here as expected, both numbers were at fresh all time highs, with a record $1.564 trillion in student loans outstanding, an material increase of $33 billion in the quarter, while auto debt also hit a new all time high of $1.143 trillion, an increase of $19 billion in the quarter.